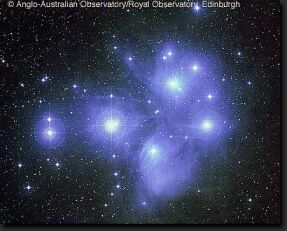 Larger labelled image of Pleiades. The Algol, or Beta Persei, compact triple-star system is located around 92.8 light-years (ly) from Sol (HIPPARCOS Plx of 35.14, +/- e_Plx of 0.90 mas). The star lies in the west central part (3:8:10.1+40:57:20.3, ICRS 2000.0) of Constellation Perseus (see chart and photo), the mythical Greek Hero who uses the Gorgon Medusa's severed head to change Cetus into stone -- southwest of Mirfak (Alpha Persei). Among others, the Ancient Greeks referred to Algol as the "evil eye" of Medusa probably because of its regularly changing brightness and color. 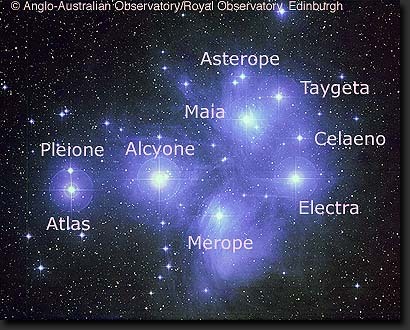 In the venerable Star Names: Their Lore and Meaning, Richard Hinckley Allen noted that while its proper name, Algol (the Demon, Demon Star, and the Blinking Demon), is said to be derived from the Arabic "Ra's al Ghul" for the Demon's Head, "people probably took the title from Ptolemy" since "Al Ghul literally signifies a Mischief-maker, and the name still appears in the Ghoul of the Arabian Nights and of our day." Max Planck Institute, ROSAT -- The Algol system is bright in X-rays (more). According to Robert Burnham, Jr. (1931-93), the "first definite statement" on Algol's variability was by Geminiano Montanari (1633-87) of Bologna around 1667. The regularity of the variable's period, however, was not determined until 1782 or 1783 by John Goodricke (1764-86), who also correctly interpreted the variations as being caused by partial stellar eclipses. Algol's binary nature was confirmed in 1889 by Hermann Carl Vogel (1841-1907) in Potsdam who found periodic Doppler shifts in the spectrum of Algol A and the overlaying spectrum of Star B. In addition to the close binary AB, however, there is a third stellar companion C. Star C's presence was first indicated in narrow spectral lines found by Frank Schlesinger (1871-1943) in 1912 and in orbital motions posited as caused by a third body by Dean B. McLaughlin in 1934. It was soon found in spectrum photographs by Joseph Algernon Pearce (1893-1988) but his unpublished finding was not reported until 1939 by W.E. Harper. Hence, spectroscopically re-confirmation of its discovery was published in 1957 Alan S. Meltzer and Otto Struve and Jorge Sahade. (See an animation of the orbits of Stars A, B, and C, with a table of basic orbital and physical characteristics.) According to the Yale Bright Star Catalogue's notes entry for HR 936, Algol also has four optical companions. 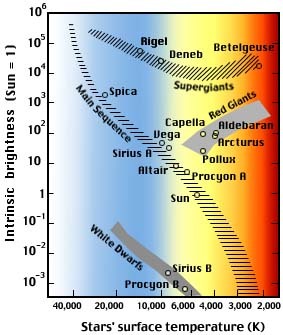 Algol A is a blue-white main sequence star of spectral and luminosity type B5-8 V. The star may have a mass 3.59 times Sol's (Molnar and Mutel, 1996, Table 1), 2.88 times its diameter (Ho-Il Kim, 1989); and Johnson and Wright, 1983, page 653); and as much as 98 times its visual luminosity (around 200 times with ultraviolet). Possibly less than 300 million years old, it has a fast rotational velocity of 65 km/sec. Useful catalogue numbers and designations for the star include: Bet Per A, 26 Per A, HR 936*, GJ 9110, Hip 14576, HD 19356, BD+40 673, SAO 38592, FK5 111, Wo 9110, and ADS 2362 A.
Algol A is a famous variable star and is the first and title member of the well-known class of Algol-type eclipsing variables. The star is separated from its close companion "B" on average by only 0.062 AUs (a semi-major axis of 0.00218" at a HIPPARCOS distance estimate of 92.8 ly). Their highly circular orbit (e= 0.00) takes only 2.87 days to complete. From the perspective of an observer on Earth, this orbit is inclined at 97.69° but is adding by 0.1° every century (see: Molnar and Mutel, 1996, Table 2). A third star "C" orbits the close binary pair (AB). According to the new Sixth Catalog of Visual Orbits of Binary Stars, the binary pair AB and Star C have an average separation of 2.69 AUs (a semi-major axis of 0.0946" at a HIPPARCOS distance estimate of 92.8). Their eccentric orbit (e= 0.225) takes almost 681 days (1.86 years) to complete. The orbit is inclined by 83.98° from Earth's line of sight (Pan et al, 1993). The orbit of Star C actually changes the spectrum of the system every couple of years. As Professor Jim Kaler notes in his Stars page on Algol, Algol is also famous for the "Algol Paradox." Because higher mass stars consume their core hydrogen faster, Star B must have once been more massive than Star A as it already became a giant star in the recent past (astronomically speaking) although both stars were borned at about the same time. Since B is now less massive than A, however, astronomers believe that B has lost much of its original mass. The two stars orbit so close to each other (0.062 AUs) that, as Star B swelled up to be a giant star, its companion Star A could produce tides in Star B that causes gas in B's now swollen outer envelope to flow to Star A. 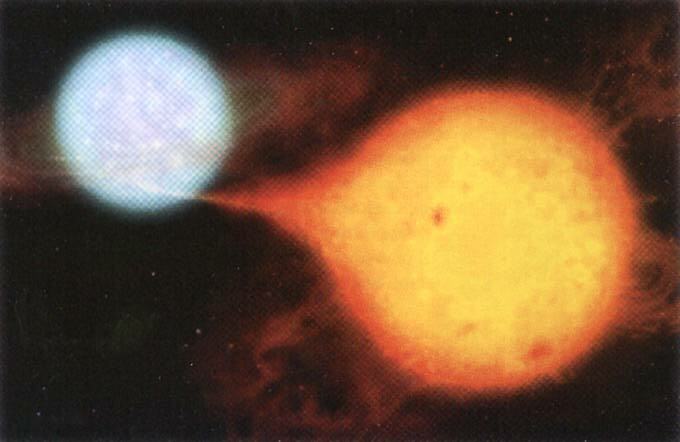 The Algol system has been observed to exhibit giant x-ray flares which appears to be linked to the dynamo and oscillation activity of stellar magnetic fields and interactions with mass transfer and stellar "magnetic braking" activity in the close AB binary (Schmitt and Favata, 1999a and 1999b; Stelzer et al, 1999; Sarna et al, 1998; and Ottmann and Schmitt, 1995; among others). 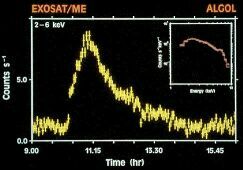 In addition, radio flares extending to about one AU, that were not associated with X-ray activity, also have been observed. According to the Yale Bright Star Catalogue's notes entry for HR 936, radio flare activity appears to be correlated with periodic discontinuities that are attributed to "starquakes." Once the most massive star in this triple-star system and recently a highly evolved giant star in astronomical terms, Algol B is a orange-red star of spectral and luminosity type K0-2 IV, which has been classed as yellow as G8 or earlier. It has become a cool low-mass subgiant in which tidal forces from companion A have distorted the swollen, outer gas envelope of the star into a teardrop shape within the Roche-lobe gravitational limit of B, before being pulled out in a "star [or accretion] stream" to fall onto its now more massive stellar companion. The star may have around 79 percent of Sol's mass (Molnar and Mutel, 1996, Table 1), 3.54 times its diameter (Ho-Il Kim, 1989), and around 3.4 times its luminosity. Useful catalogue numbers and designations for the star include: Bet Per B, 26 Per B, HR 936 B*, GJ 9110 B, Wo 9110 B, and ADS 2362 B. Resolved by speckle interferometry, Star "C" is a bluish white main-sequence dwarf star of spectral and luminosity type A5 V (Ho-Il Kim, 1989), previously classed as yellow as F2 (Alan S. Meltzer, 1957). It may have 1.67 times Sol's mass (Molnar and Mutel, 1996, Table 1), 1.7 times its diameter (Ho-Il Kim, 1989), and around 4.1 times its luminosity. Useful catalogue numbers and designations for the star include: Bet Per C, 26 Per C, HR 936 C*, GJ 9110 C, Wo 9110 C, and ADS 2362 C.
The following table includes all star systems known to be located within 10 light-years (ly), plus more bright stars within 10 to 20 ly, of Algol. Up-to-date technical summaries on this star can be found at: the Astronomiches Rechen-Institut at Heidelberg's ARICNS; the HIPPARCOS Catalogue using the VizieR Search Service mirrored from the Centre de Données astronomiques de Strasbourg (CDS); NASA's ADS Abstract Service for the Astrophysics Data System; and the SIMBAD Astronomical Database mirrored from CDS, which may require an account to access. Additional information may be available at Roger Wilcox's Internet Stellar Database. Perseus is the mythological hero of the Ancient Greeks who rescued Andromeda from Cetus the Sea Monster. In Earth's night sky, the figure of Perseus is thought to hold the head of Medusa in his hand -- where Algol represents her evil eye (more). For more information and an illustration of the constellation, go to Christine Kronberg's Perseus. For another illustration, see David Haworth's Perseus.